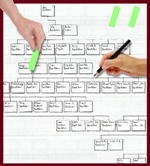 We can print your family history chart from your favourite genealogy program or website or supply you with a chart to fill in by hand. A4 Springback binders in portrait and landscape. 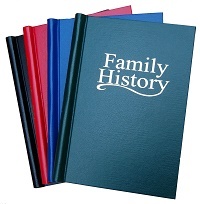 Includes plain, printed with 'Family History' or window, 9 colours and 3 different finishes. Professional Print and Bind Service for small print runs of one or more books. Choice of cover designs and finish. A collection of products for scrapbooking including acid free glue, v mounts for photos, A4 holdalls, square pockets and card. Archive quality A4 and A3 Acid-free paper and Acid-free pens.